The Toronto South Detention Centre opened in 2014. This maximum-medium security correctional facility was built to replace three local jails in the Toronto: the Toronto Jail (Known as the Don Jail), the Toronto West Detention Centre and the Mimico Correctional Centre. The Mimico Centre, parts of which dated back to 1887, was finally demolished in 2011 to make room for the new state-of-the-art Toronto South Detention Centre. As the second largest jail in Canada, the Toronto South Detention Centre has a capacity for over 2000 inmates. By law, all inmate property must be stored safely while individuals are incarcerated. At this centre, anywhere from 200-400 inmates may be entering or leaving the facility on a daily basis requiring either storage or access to their individual personal property. Efficient and secure management (storage and retrieval) of this large amount of property was a key requirement for the new inmate property storage system at the Toronto South Detention Centre. 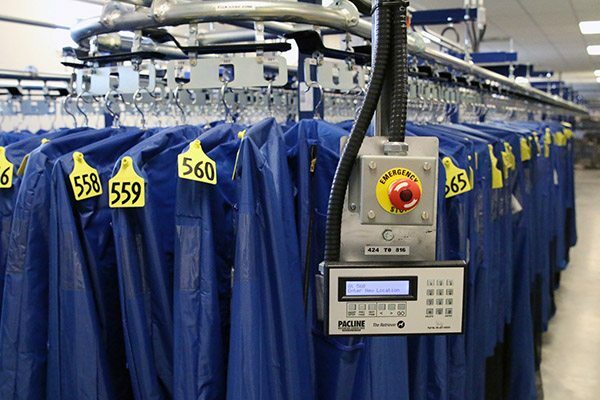 PACLINE Overhead Conveyors was contracted to provide a fully automated garment bag handling system to manage all inmate property for the Toronto South Detention Centre. PACLINE’s Inmate Property storage and retrieval system uses their industrial-quality PAC-LINE™ enclosed track conveyor. Pacline also provided all mechanical and electrical design and installation. The PACLINE Inmate Property Storage system provided a highly efficient system for managing the property of over 2000 inmates. Using 5 separate conveyor loops helped to minimize retrieval time for any one garment. Only a single operator is required to store or retrieve an average of 300 property bags a day. In addition, the PAC-LINE™ conveyor system offers greater safety for the detention centre operators. The enclosed-track design eliminates dangerous pinch points common in open sprocket type conveyor systems and ensures the fingers for the operators cannot come in contact with the moving chain. PACLINE Overhead Conveyors will be exhibiting this year at the American Jail Association Conference in Orlando, Florida April 21-25, 2018. Be sure to visit us at booth #513!